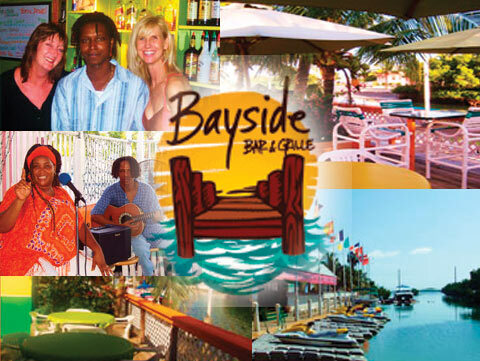 BAYSIDE BAR AND GRILLE (3101 N. Roosevelt Blvd) is the place for those looking for a unique Key West experience! Located on the water adjacent to the Blue Lagoon Motel, Bayside's quaint "old town feel", and cool island breezes make this the best new dining destination in town! The newly redecorated caribbean atmosphere creates a bright and inviting environment enjoyed by locals and tourists alike. Bayside patrons regularly enjoy the company of the managing partners, Patricia "Patsy" Roholt and Marvel Pinto whose commitment to customer service and satisfaction is evident. Bayside, boasts a large and tasty menu! Featuring house made bar-b-que ribs, roasted chicken, steaks, their famous "Seafood Steamers" and the "all you can eat" lunch special of shrimp or fried fish. The bartenders specialize in tropical drinks and they also have an array of imported and domestic beer, as well as a full line of premium spirits. Enjoy watching the activity on the water during the day at the adjacent watersports facility. At night the reflections of palms, mangroves, and moonlight on the water are nothing less than stunning! Live island music is featured most weekend evenings with international DJ music daily.